30x40 Brown Mesh Tarp. 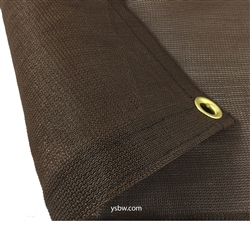 Brown Mesh Tarps give 73% shade and are made from Heavy Duty Polypropylene with Hemmed and Rope Reinforced Edges with Aluminum Grommets every 18 inches. Please Note: All Brown Mesh Tarps are Approximately 4-6” shorter by length and width than the stated cut size.